MCD represents 95% of all cases of childhood idiopathic nephrotic syndrome (INS) and 30% of INS in adults of all ages and is not exceptional after 60 years. Albuminuria and hypoalbuminemia are accompanied by massive edema without reduction of blood volume. Renal function is moderately altered in 1/3 of patients with MCD, as foot process fusion impairs filtration of small molecules. The GFR returns to normal with remission of proteinuria. Since the early 1960s, a number of publications reported cases of acute oliguric kidney insufficiency complicating the course of MCD in adults. AKI mostly affects older patients with massive proteinuria, severe hypoalbuminemia, a background of hypertension, and arterial/arteriolar lesions on kidney biopsy. Histology reveals ischemic tubular necrosis. AKI may require dialysis for several weeks or months until treatment-induced remission allows resolution of oliguria. In rare cases AKI does not recover. 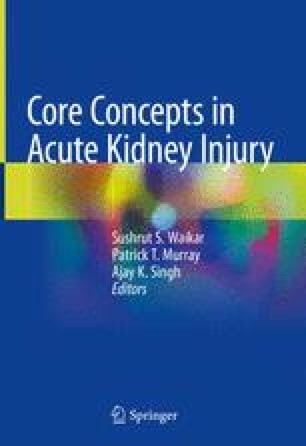 Factors causing AKI in patients with MCD are diuretic-induced hypovolemia, NSAIDs, iodinated contrast media, and nephrotoxic drugs. AKI is not frequent in children with MCD in the absence of intercurrent complications. Conversely when steroid-resistant nephrotic children are hospitalized for an acute episode of hypovolemia, sepsis, peritonitis, and exposure to nephrotoxic medications and/or ACE inhibitors, AKI complicates NS in about half of them. The main goal of supportive therapy is to buy time until corticosteroids obtain a remission of proteinuria. Persistent oliguria may require a long period of dialysis. Prevention is based on early detection and treatment of infection, limited use of diuretics, and avoidance of nephrotoxic agents. The authors deny any conflict of interest with regard to this chapter.